Last weekend, some lucky Comic-Con attendees were treated to a screening of Lawless, the Prohibition crime thriller from director John Hillcoat (The Road) starring Shia LaBeouf, Tom Hardy and Jason Clarke as the Bondurant Brothers, three bootlegging brothers in Virginia, who have to fend off the cops and a growing mob empire. Alex saw the film at Cannes earlier this year and gave it a pretty great review, and now that the summer is winding down, the late August release is getting closer. That means it's time to raise the awareness, and that burden falls on LaBeouf this time who takes the spotlight on a new poster. Look! John Hillcoat (The Road, The Proposition) is directing Lawless from a screenplay by Nick Cave which is based on Matt Bondurant's novel The Wettest County in the World. The film follows a bootlegging gang (Tom Hardy, Shia LaBeouf and Jason Clarke) in Depression-era Franklin County, Virginia, threatened by authorities who want a cut of their profits. Jessica Chastain, Gary Oldman, Mia Wasikowska, Guy Pearce, Noah Taylor and up-and-comer Dane DeHaan (from Chronicle) also appear in this. 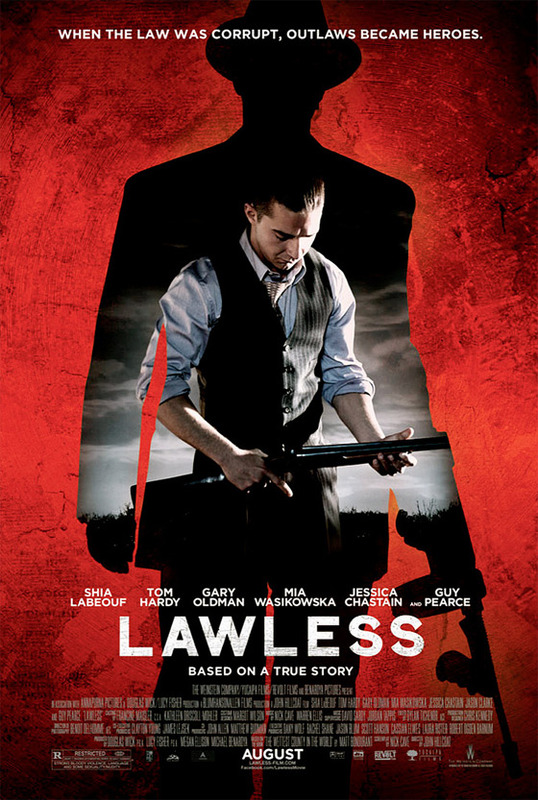 The Weinstein Company first premiered the film at the Cannes Film Festival and will release Lawless on August 29th this year. I like it a lot. The red really works well, imo. It doesn't always have to be sepia or black and white. Shia looking at gun: "How do you work this thing, I should have had this in Transformers I could have killed Megatron and have been supreme leader of the Autobots! Wait how do you work this thing anyway...wait your taking a picture of me...very funny guys :)"
Shia LaBeouf as tough guy just doesn't work for me.